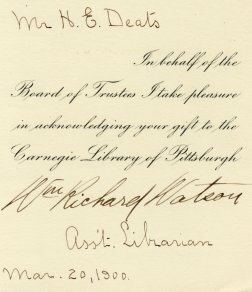 I recently acquired a March 20, 1900 thank you note from the Carnegie Library of Pittsburgh sent to H. E. Deats. Mr. Deats had donated the London Philatelist Vols. 1-7 “from the American Philatelic Association”. I have previously written about the Pittsburgh library’s custody of the American Philatelic Association’s (now the American Philatelic Society) library. When I acquired the thank you note, I didn’t know anything about H. E. Deats. Through the wonder of the Internet and Google, I now know much. Hiram Edmund Deats (1870-1963) is a member of the APS Hall of Fame. According to his Hall of Fame entry he was “one of the foremost collectors of the 19th century” and he “formed an enormous philatelic library, a close second to that formed by John K. Tiffany.” I found a detailed description of the Deats philatelic library on the Earl P. F. Apfelbaum, Inc. website which has a number of historic documents in its online “Philatelic Library“. That description was written by Alvah Davison in 1888. A large part of the Deats philatelic library went to the Free Library of Philadelphia in 1952. The rest was sold to private collectors through auction over a period of years. One of the major philatelic interests of Deats was revenue stamps. I found information about his interest in this area from a post at the “Philately of Today” blog. Deats was involved in many civic pursuits. He was the first president of the Flemington (NJ) Library Association, a predecessor to the Flemington Free Public Library. He donated the land for the first Flemington Free Public Library building. The Hiram E. Deats Reference Library, a genealogical library, in Doric House in Flemington, NJ is named for him. Deats was an active member of the New Jersey Society of the Order of the Patriots and Founders and accumulated many records for this organization which are now housed in the Rutgers University Libraries. A number of articles about private philatelic libraries have been written by Herbert Trenchard and Stanley M. Bierman in Philatelic Literature Review. If you search for “Hiram E. Deats” in the APRL’s online catalog, you will find numerous articles and publications relating to this philatelic pioneer. You can never tell where piece of ephemera can lead. This one has certainly been enlightening for me.